This book is the first in the “Underworld USA Trilogy”, which also includes “The Cold Six Thousand”, and “Blood’s a Rover”. 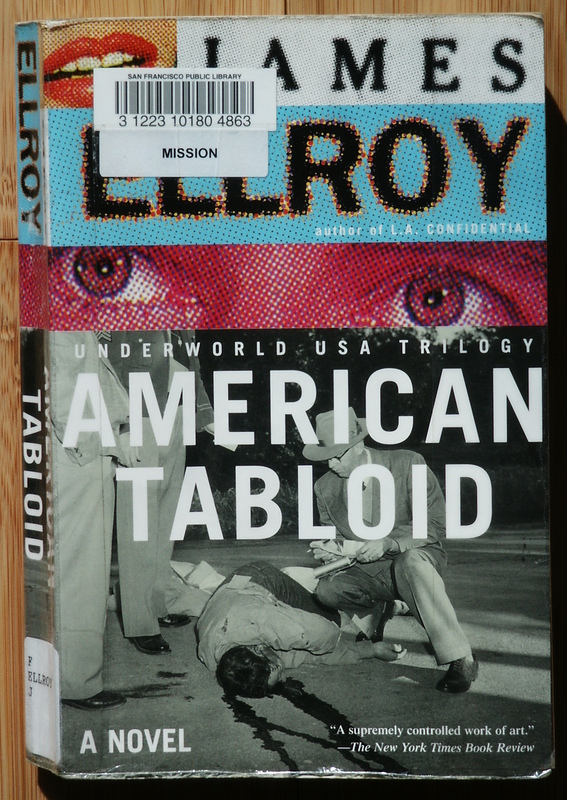 They follow a precise chronology of crime and politics starting on 11/22/58 through 11/22/63 for “American Tabloid” and ending in May of 1972 at the conclusion of “Blood’s a Rover”. “American Tabloid” introduces three fictional protagonists; two FBI agents, and a private investor, former cop. Most of the narration is from the point of view of one of these characters as they interact with lesser fictional characters and a cast of actual historical figures. The story dovetails a fictional plot in between the pages of real history. A Shakespeare-like complex web of intrigue, corruption, and backstabbing coalesces between rival camps of organized crime, the FBI, J. Edgar Hoover, the Kennedy’s, the CIA, Jimmy Hoffa, Howard Hughes, American and Cuban exile leftists and right extremists, and the Ku Klux Klan. Several real life mafia figures play a prominent role. Other actual people are mentioned or play minor roles in the periphery, such as: Frank Sinatra, Peter Lawford, Marilyn Monroe, Eva Gardiner, Rock Hudson, Fidel and Raul Castro, and Fulgencio Batista. Much of the dramatic tension focuses on the rivalry between J. Edgar Hoover, John and Robert Kennedy, and the mafia, and between Joe Kennedy and Howard Hughes. Major conflicts also ensue between pro and anti-Castro Cubans and various American organizations, such as the CIA backing one side or the other. Most of the prominent characters including the three protagonists have complicated shifting allegiances. One of the main themes of the book involves the sameness in absence of morality, principles, and conscience, across the spectrum of characters. Murder, extortion, and other felonies seem to be the standard modus operandi for all with few exceptions. Enemies become allies, winners become losers, as money, power, and self-preservation are the only principles. Another theme is injustice as prejudice and sometimes violent hatred plays out against, African-Americans, Cubans, gays, leftists, Jews, and women. Stylistically, the book portrays a harsh realism with coarse profane language and graphically depicted extreme violence. Most of the book club members found the language and numerous gruesome murders to be over the top and unpleasant to read. I felt that the dialogue was true to life for the type of characters depicted, other members found it contrived. One member presented the idea of the author’s thesis being the possible mob and CIA conspiracy to assassinate JFK. Apparently several non-fictional books have come out to support that idea since “American Tabloid” was written. The narration sometimes inserts transcripts of wire tapped conversations, newspaper articles and other documents to supply information shared secretly among allied characters. There are 100 short chapters over 576 pages which become shorter as the pace quickens. The book seems to me to be reaching for a deeper purpose than just an entertaining crime thriller: a retelling of history, an expose of seaminess in American history, and a character study in the interchangeable nature of “good guys” and “bad guys.” I enjoyed it, although most of the others in the group did not. Season of The Witch, by David Talbot, gives a history of San Francisco from 1967 to 1982 in 406 pages. Published in 2012, it borrows the title of Donovan’s hit from 1966 which alludes to times of social upheaval. During that period, San Francisco was the epicenter for two social movements, the first being the hippies of the 1960’s counter-culture and the second being the gay rights movement, also starting in the 60’s, but taking off in the 1970’s.